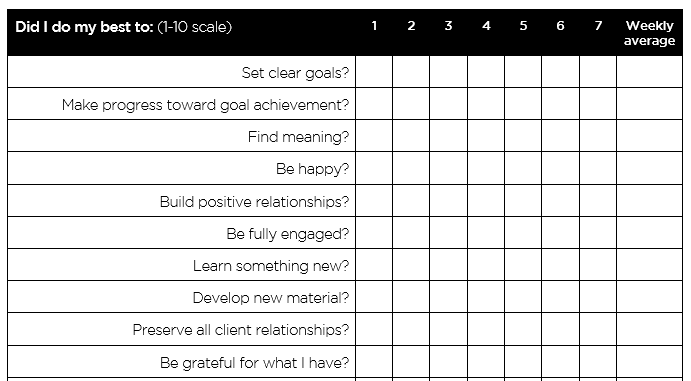 Once you have identified your own set of things you really want to work on and converted these into a series of Did I do my best to… questions, then the task is to rate yourself each day on a simple 1 – 10 scale. Over the course of a few weeks you may find yourself giving low ratings for the first few days, but over time as you become more conscious of it (or perhaps more guilty about it) you may start to see a gradual or even sudden upwards shift – you really start to make progress and feel good about it as a new habit is being formed. Of course, if you just find yourself continuing to rate yourself lowly on some questions, it provides you with some really useful data – you can ask yourself what is going on for you, why is it not shifting, is it really important to me? This approach to helping you make personal changes is wonderfully simple and potentially very powerful. We love it so much we’ve put together a template for daily questions that you can populate with your own set of daily questions – please follow this link to download a copy for your personal use. ← Supportive or demanding : A chart to make you rethink parenting – and leading!